On February 3, 2013, I lost one of my best friends, Forrest Peck. Forrest was the first person to offer me his friendship and guidance when I changed schools my senior year of high school. He died in a car crash at the age of 23. I got the call from my friend that he had passed and it hit me hard. My college midterms were beginning that week, in St. Cloud, Minnesota, and it was then that I realized I would have to miss his memorial service that was to be held in Santa Cruz, California. Since I was unable to attend his memorial and funeral service and because we were such close friends, I wanted to do something special for him at the service. It was my goal to give everyone attending the services something to take home and remember Forrest by. I decided to send his family some plantable heart cards to hand out at the memorial and funeral services. These cards have a removable white heart, paper-like cutout that have wildflower seeds inside of them. When planted in soil wildflowers will grow in his memory. I was able to put a personal saying, “Brother to many, friend to all”, on the card along with his name. and sent to Forrest’s family. The day of the memorial, I received phone calls from some of my good friends telling me that the cards were a hit. 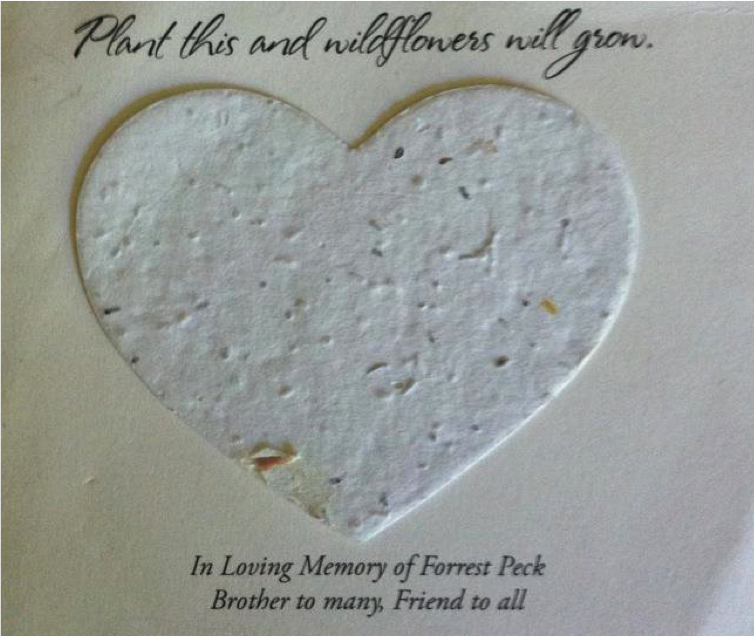 Everybody that attended the service will now have something to remember Forrest by in both the card and removable plantable heart that will eventually grow into wildflowers. A few days later when I was visiting one of our mutual friends, I saw the card on the mirror of his dresser in his room, and I smiled that he kept Forrest’s card in such a prominent place. I still wanted to do more in the name of my close friend Forrest, not only for myself but also for our good friends. That’s when another idea came to me. 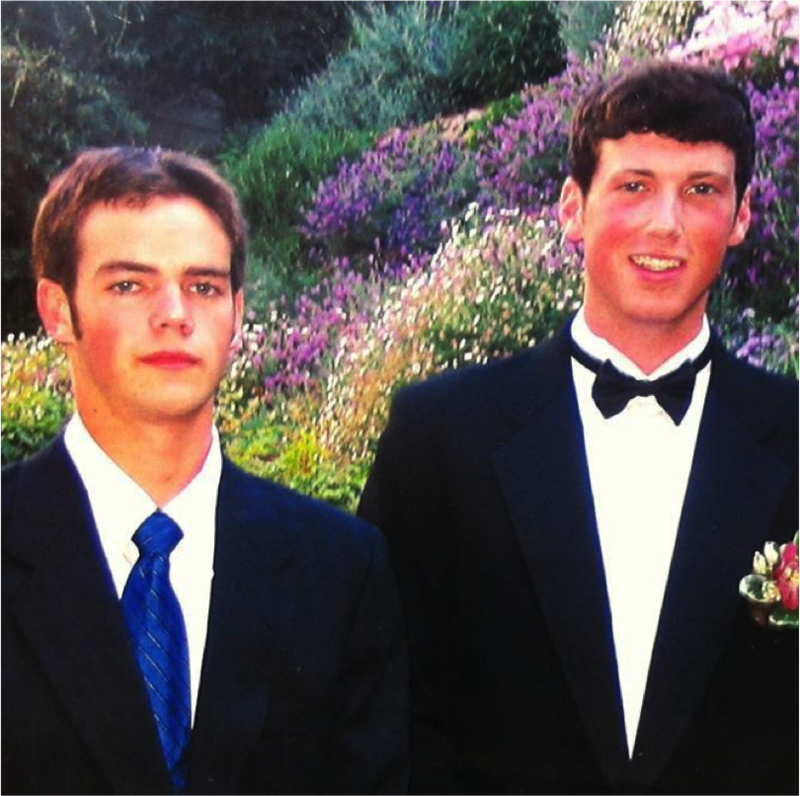 Forrest lived in Stinson Beach, California and we had some incredible times in that small beach town with all of our high school friends. Forrest, myself and our friends had a favorite spot where we would watch the sunset frequently above his hometown. This view on top of Mount Tamalpais overlooks Stinson Beach and Northern California’s rolling hills. On a clear day, you can even see as far out into the ocean as the Farallon Islands. 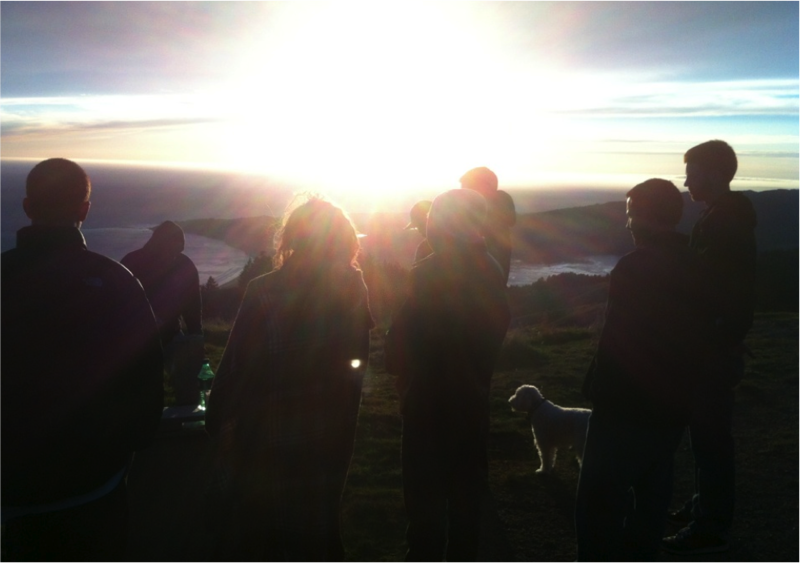 Friends, family and dogs at his sunset memorial watching the sun disappear into the Pacific Ocean. I decided to make a Facebook page and invite friends and loved ones to have our own small service and take some time to remember Forrest together up at our special sunset spot. I named the Facebook page “Remembering Forrest at Sunset with Candles.” Many people liked the page as it got a lot of attention and it was a good resource to use so I could see who would be attending. at our favorite spot to watch the sunset. Lots of our friends showed up on the top of the mountain for the sunset service, some I hadn’t seen or talked to in years. The candle lighting brought out all kinds of emotions. Stories were shared that had us laughing and crying at the same time. His father and Uncle came with their dogs, which Forrest also loved. 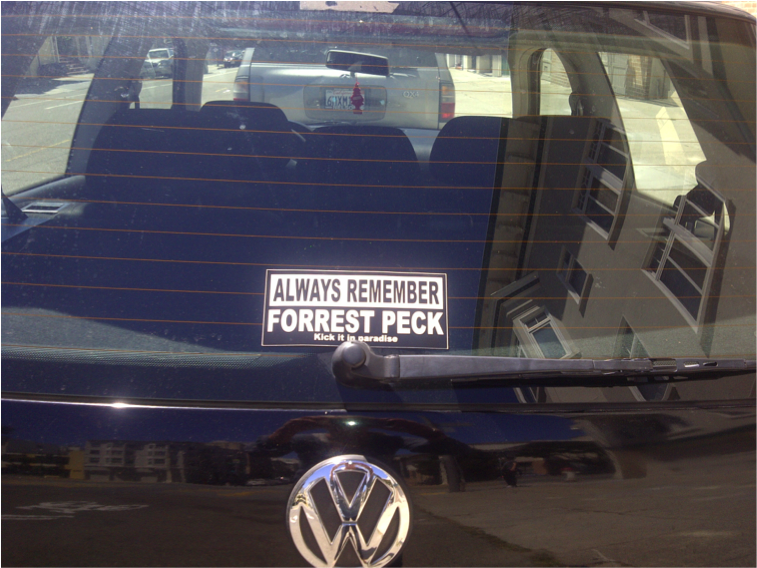 Forrest’s father had bumper stickers made for us that read, “Always Remember Forrest Peck Kick It in Paradise” a saying Forrest would frequently shout out. and gave them to us at the candle lighting. His father and Uncle were very thankful and touched that so many of Forrest’s friends came. During the sunset service, some hippies walking by told us that we would see a comet fly through the sky in about thirty minutes. Sure enough, twenty-five minutes later we all witnessed what we now call “Forrest’s Comet” soaring through the sky. It was a magical night that will be remembered forever. 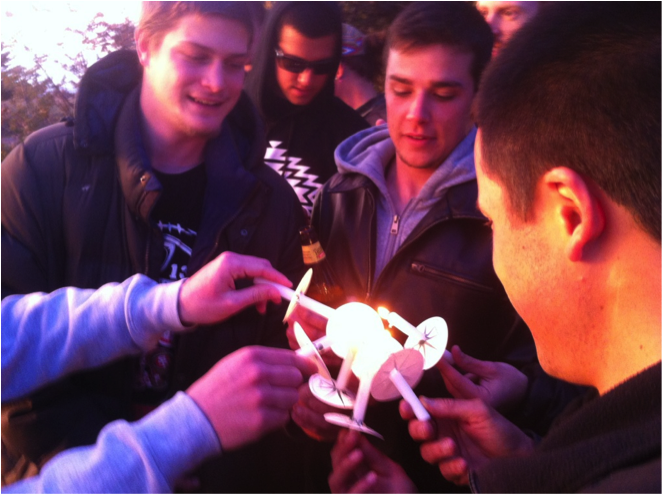 Because the sunset memorial was such a success, we made a pact that day that every year on the same date and place we will meet and light candles so Forrest will forever live on in our hearts. Since Forrest grew up in Hawaii, there was also a funeral service there that I was not able to attend, however I wanted to be a part of it in any way that I could, so I decided to send out more heart cards to the Hawaii service. Friends sent pictures and some even brought their plantable heart seed cards they got at the memorial in Santa Cruz to plant in Hawaii. Both the cards and the candles fit the situation perfectly and left us with wildflowers, pictures and memories to last forever. This entry was posted in Candle lighting memorial service, Dealing with Grief, Funeral Gifts, Funeral Planning, Ideas for creating a memorial, Life Celebration Ideas and tagged celebration of life, funeral cards, funeral ceremony, funeral favor, funeral gift, funeral ideas, funeral planning, life celebration, life celebration ideas, memorial cards, memorial favors, memorial gifts, memorial seed cards, memorial service ideas, Plantable Wildflower Seed Heart Card, popular funeral favors, share funeral experiences. Bookmark the permalink.